Ah cross-dressing; it's an English tradition. I love it, you love it, David Walliams loves it and (perhaps unsurprisingly given the title) so does Dennis, the 12 year old hero of the Boy in the Dress. Writing his first book for children Walliams sympathetically taps into his own longstanding interest in feminine finery and in the process repairs some of the gentle damage he did creating Little Britain’s Emily ‘I’m a lady’ Howard. 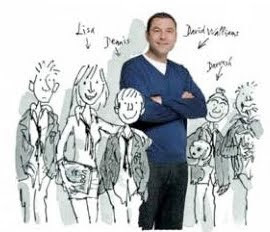 Although teenage transvestism might appear unlikely fodder for a children's book, Walliams manages it deftly. He is clear that Dennis's predilection for women's fashion has no impact on his footballing abilities nor does it prevent him having a lustful crush on Lisa, the school fashionista Lisa who encourages his interests in increasingly involved and daring ways. I have no idea what the 9 to 12 year olds this funny, energetic and ultimately rather sweet book is aimed at would think, but to me Dennis’ lone-parent family troubles were well handled and didn’t feel at all contrived. Whilst the same couldn’t be said of the slightly silly ending the Boy in the Dress’ big idea – be who you are and not who other people want you to be – seems like a good reason to write a children’s book. The biggest coup for Williams is the inclusion of Quentin Blake’s always-wonderful visuals. 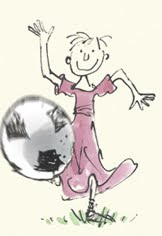 Having Roald Dahl’s illustrator onboard immediately adds to the impression that the Boy in the Dress is somehow part of the Dahlian canon and it’s fair to say that give or take one too many contemporary references to reality television and a plot mostly grounded in the real world Walliams succeeds in emulating his idol’s knack for escapist pre-teen thrills. 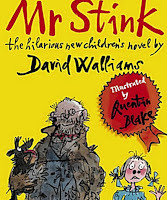 The same is not quite true of Walliams’ second children’s book, Mr Stink which whilst infused with a similar infectious energy and cheeky breaking of the fourth wall, as well as Blake’s wonderful drawings, feels a little more forced. This time our hero is Chloe, another twelve year old with parent-induced self-esteem issues who finds friendship in the form of a putrid-smelling homeless man called (aptly) Mr Stink. At war with her revoltingly overachieving younger sister Annabelle, bullied by school colleagues and put down by her mother for carrying a bit of extra weight young Chloe hides away from the world, devoting herself to her creative writing that she dare not share with anyone. No-one that is apart from Mr Stink who encourages her to tell him night time stories as he beds down in the family shed. 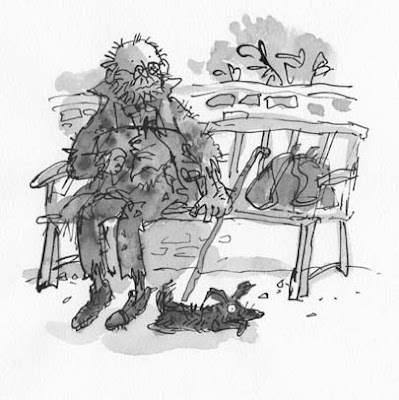 Chloe spends the rest of her time letting her imagination run riot about Mr Stink's past, imagining several histories for his each time they meet. The evolution of Chloe and Mr Stink’s relationship is nicely done, but her politically ambitious Hyacinth Bucket-like mother and down at heel ex-rocker father don’t feel quite as plausible. Perhaps this is part of the point as Mr Stink sees Walliams let his own imagination loose more than Boy in the Dress, resulting in helicopter rides to meet the Prime Minister in Downing Street (an untrustworthy, slightly smarmy man called Dave, interestingly for a book published long before the 2010 election) and a flatulent appearance on Question Time. There is another welcome outing for Raj (this time trying to offload a crate full of Teenage Mutant Ninja Turtle stationery sets) and some lovely descriptions of Annabelle's daily diary ('2am Learning Arabic; 3am Dance Lesson - breakdance, hip hop, krumping; 4am Oboe; 5am Tour de France cycle training etc) but overall there was less joy than his first volume. It is possible that Walliams has nothing left in his children’s literary locker, but in Mr Stink, and especially the Boy in the Dress he can at least boast two highly likeable, endearing and above all fun books to add to his growing list of achievements.